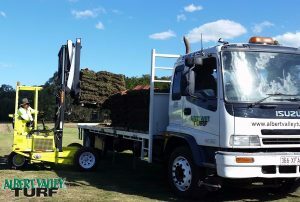 We only sell and distribute turf in Queensland. We do not deliver overseas. We do not deliver over the Tweed heads border due to Fire Ant regulations. Due to noise restrictions imposed in Metropolitan and residential areas we cannot deliver till after 6.30am Monday- Friday and after 7am on Saturday. All prices include a goods and services tax or GST. All orders must be paid for 48 hours prior to delivery. This can be done by providing credit card details to our office or requesting a tax invoice to be emailed with our banking details. If paying by direct transfer please allow the payment to be cleared 48 hours prior to delivery. If for any reason you need to cancel your turf order 48 hours notice is required to obtain a full refund. If you do not give us adequate notice and your order has already been cut, you must pick it up at the agreed time and no refund will be given. Standard delivery costs do apply for order under 200sqm. Out of area charges can be incurred to some suburbs. To find out your delivery charges please call our office and state your suburb and sqm required. The delivery price stated at the time of booking is based on one delivery to one address on one day only. If you request a split delivery on separate days or to different locations then additional delivery fees will be incurred. We accept no responsibility for the quantity of turf ordered and supplied. If you have under ordered you are more than welcome to call the office and place an order for pick up or delivery giving 48 hour’s notice. If you have over ordered you may not return unused turf. When placing your order you will be asked if a morning or afternoon is suitable. No delivery times are given as traffic and weather can hinder delivery times. If you have requested a time for delivery on a particular day it will be an estimated time only and we will try our best to get as close to that time as possible. Our driver will notify you by phone approximately 1.5 hours before delivery that he is on his way. If you do not answer a text message will be sent. No voicemails are provided. Turf is delivered via our truck to the address specified at the time of booking. Our truck is equipped with a forklift 2.4 metres wide and 3m tall. Standard delivery includes disembarking the turf off the truck and placing them on the kerbside. If you are home at the time of delivery and would like the turf to be placed elsewhere around the property it is up to the discretion of the driver whether the instructions can be adheared to. Using access paths which can be hazardous to our driver eg powerlines, tree branches, steep slopes or slippery terrain will not be permitted. Pallets will not be left on site at any time, all turf is unloaded from the pallet on the truck and placed carefully on the kerbside or driveway. We accept no liability for any damage caused to surrounding areas where the customer has asked the driver to place the turf. 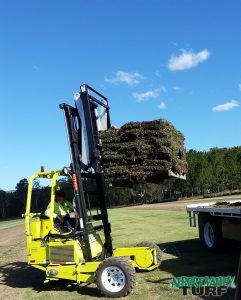 When your turf arrives it is important to inspect the condition of the turf immediately after it has been unloaded. If there are any problems please capture a photo and contact our office immediately. We do not accept any liability after 24 hours from the time of delivery. Fresh lawn that is to be delivered must be laid on the same day as it has been delivered to prevent deterioration. It is a live product and will only survive 24 hours on a pallet. We do not accept any responsibility for lawn that is not laid on the day of delivery. Rain affects Albert Valley Turf being able to harvest. If we have experienced rain and you have placed an order we will call you on as soon as possible to postpone the order till a later date. We will keep you informed and up to date on when we expect to be able to deliver. If we cannot deliver your turf by the time you need it, a full refund will be offered. We will directly deposit the amount paid into your bank account. Please allow 2 days for clearance.